lol, make it close the start menu and have all of them fall. Just so we're clear here... GIMP has no sprite animation features. none at all. Every single lemming was hand-positioned for every single frame. I am never touching this GIF again. Ever. I'll give you a five, for tracking the music. Becauce Lemmings are teh pwnz0rs. 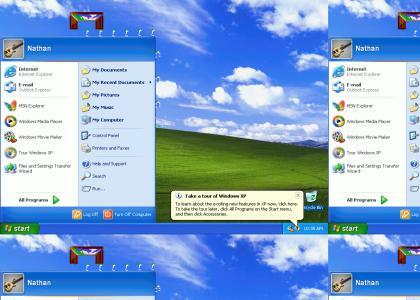 the Windows XP desktop was from google images - last time i did an XP site, everyone bitched about not having the fisher-price shiny blue plastic theme enabled. i'm not putting that sh*t on my desktop, so i used someone else's. And who the hell is nathan? holy crap....my name's Nathan, my icon is the same as yours and I also use the gimp for all photo editing....FIVED!!!! Somebody give those poor bastards those umbrella thingies. LMFAO Class job. VERY well played. i think ytmnds voting thing is down cause i cant give ppl fives. This is f*cking awesome. Long live Psygnosis. i wonder how long until someone downvotes because there isnt a firefox link there. i hate that. 5 for Firefox.lnk being obscured by Start menu. Holy sh*t, you did that on GIMP? Man you must have a lot of spare time. Another original spazdor track! Also, good call on the "fisher-price shiny blue plastic theme". Silver > blue. Much more creative than the other "XP" fad sites. I'm not crazy about the music, though, because it sounds too good. The only entertaining songs in the XP fad are the ones that really do sound like a bunch of clicking and stuff. NATHAN YOU LEMMING-KILLER! You should have at least give them an umbrella. at first I was gonna 3 this, but then on closer inspection the lemmings are moving at the EXACT same speed as each other, which is tough to do. Not even lemmings makes an XP site OK.
my name is nathan too. 5'd. If only this was an actual feature in Windows. 5 suicidal rodents for you, sir and/or madam. I remember playing that game for hours at a time. Thank you. New copy of windows XP? I hope you nuked that level! 5 for nathan and a good YTMND... now shut up shiratski. +1 for using GIMP, +1 for using lemmings +1 for the audio, +1 for simplistic title and finally +1 for making it all come together oh so nicely. This YTMND is full of win... also nostalgia.